I thought the list might be interested in a new hot metal project I have just started in March. 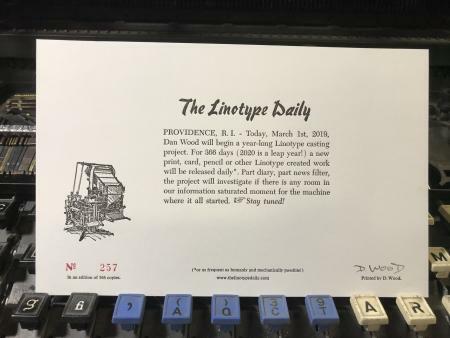 I am releasing a new Linotype cast print everyday for a year, and have somehow made it through the first month! ps. Other/Intertype operators interested in filling in for a sick or vacaLinotypetion day sometime in the next 11 months? Message me! Consider this: The U.S. Government Printing Office in Washington ran the largest battery of linecasting machines in the world (over 120 at the peak). The principal work was the Congressional Record, along with the Federal Register and U.S. Patents. The Record was the equivalent of 4 - 6 metropolitan daily newspapers (in terms of ems), every day that Congress was in session. Copy started being set in mid-afternoon, proof and make up and press continued through the night, and the Record rolled off the presses about 6 the following morning. GPO’s hot metal operation was closed out in the 80s; for the last several years the Record and Federal Register were composed in hot metal from which repro proofs were used to make offset plates. The last day of the Record in hot metal was Jan. 6, 1982. Nice one Good Buddy, & best of luck. Dan, I see your political bias, so I’m guessing I won’t be seeing an ‘Arrest Hillary” print very soon. How about a “Investigate the Investigators” - that would be inclusive of both sides. Bppayne: You know that whole freedom of the press thing means You can print anything you want. It’s invigorating and good for you. It’s also a handy way to find out how many folks share your viewpoint. Get ink on your shirt and have fun!